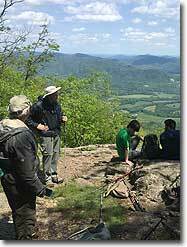 Many folks express great fear when thinking about hiking The Priest from VA 56. 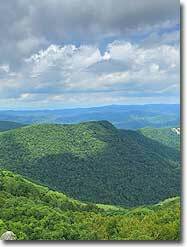 Although The Priest isn’t found on the list of the 50 highest mountains in Virginia, it rises straight up from the valley floor and forms part of an impressive skyline when driving in from the Tye River Valley. 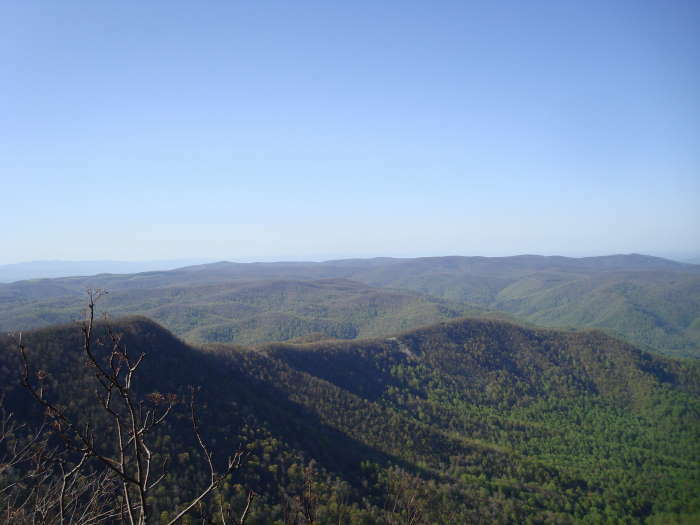 This hike involves a 3000 foot elevation gain (higher than any trail in West Virginia), however the trail is seldom steep along the way, and can be better characterized as “unrelenting” rather than difficult. Once the trail starts climbing, it maintains a remarkably constant 13% grade for 3.6 miles before steepening slightly for the last 0.3 mile to the summit. Coordinating with a second vehicle as a shuttle, you can combine this hike with a descent along the Crabtree Falls Trail to check off two great hiking destinations in less than 10 miles with less downhill stress on the knees (and more company) than hiking back down The Priest. 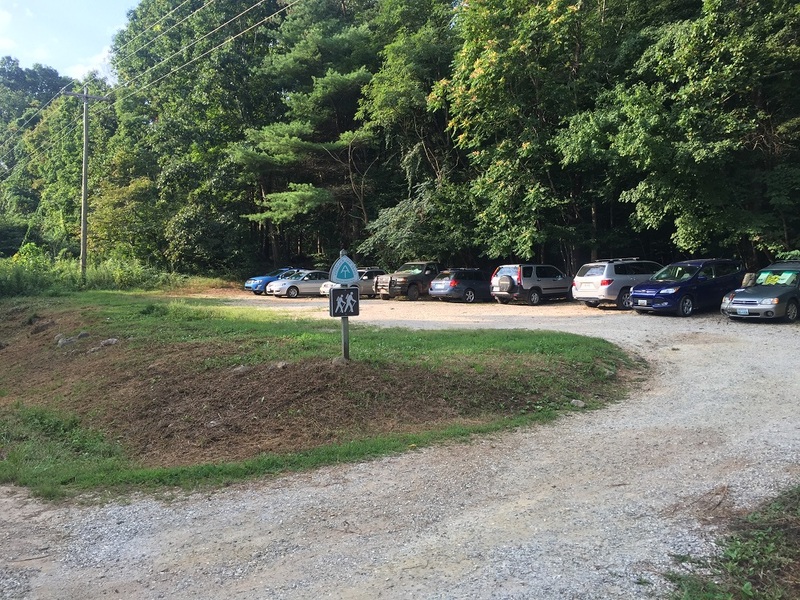 Mile 0.0 – The hike starts at an A.T. parking area on Virginia Route 56. The lot holds about 20 vehicles, and can be crowded on nice weekends. 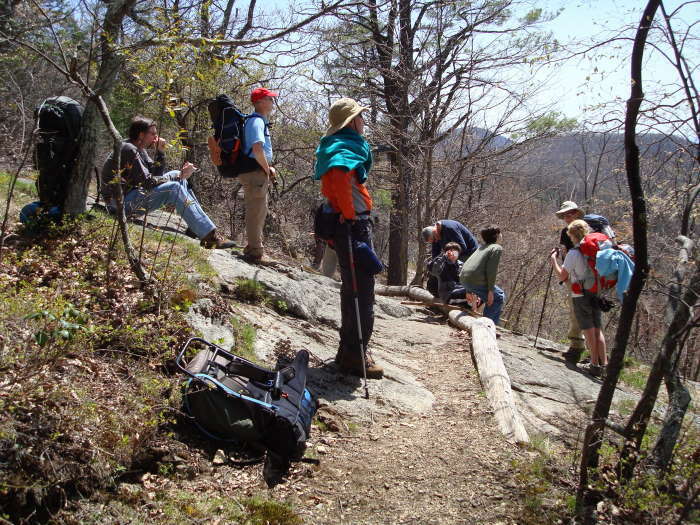 From this spot, southbound hikers climb The Priest and northbound hikers climb Three Ridges. Be sure to lock your vehicle and keep anything of value out of sight – stories abound of occasional break-ins here through the years. And, if climbing The Priest, go the correct way - don’t cross the highway! Enter the woods to the left of the information kiosk. Mile 0.1 – Enter into The Priest Wilderness after passing the wilderness boundary sign and begin climbing. Remember, federal wilderness regulations prohibit parties of more than 10 people within wilderness areas. Leave no trace! Mile 0.6 – After ascending via several switchbacks, the A.T. cuts left on an old woods road. Mile 1.2 – The A.T. crosses Cripple Creek. 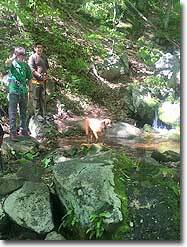 This stream crossing can be dry in late summer or more challenging during Spring runoffs. It is your last water source before the summit. Mile 2.6 – After ascending via multiple switchbacks through the mixed woods of oak and rhododendron, leaf cover gives way to a wonderful overlook to the east. Stopping for a snack and water here, while admiring the view and expressing amazement at how much elevation you have gained, is pretty much mandatory at this spot. 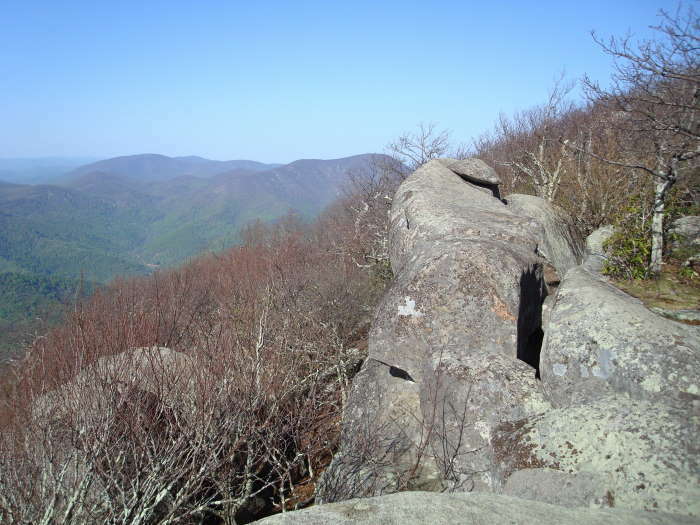 For good reason – this overlook is nearly 2000 feet above the trailhead! The view includes Three Ridges summit to the north (left) and many area apple orchards in the valley. 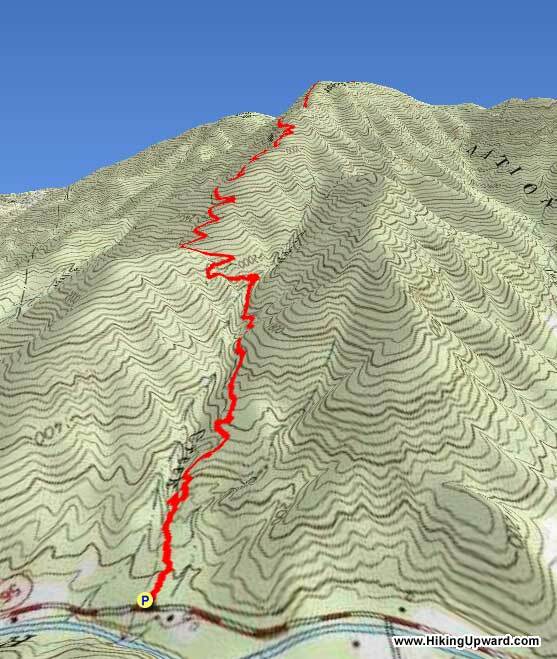 Mile 3.9 – Reach the summit after numerous false summits and switchbacks. If you hiked here in late May or early June, you may have seen the Eastern Turkeybeard flower, which grows above 3500 feet elevation along the trail, along with a few thru-hikers. Continue on the A.T. for approximately 0.4 mile, over level ground. 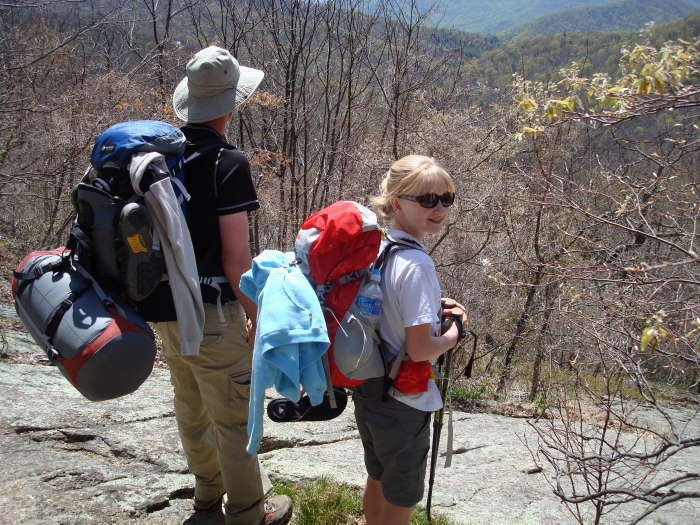 Mile 4.3 – After passing numerous smaller trails that lead to potential campsites and dead ends, follow a well worn trail right to a large set of rocks on the western edge of the summit. 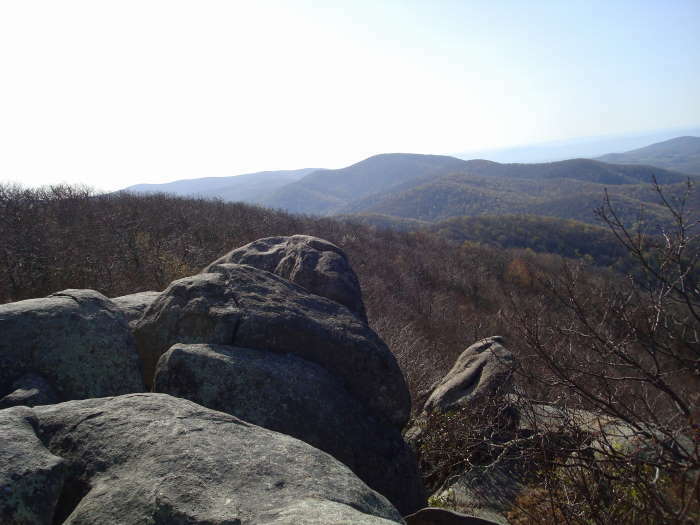 These rocks give an overview to the west and north, including Three Ridges and mountains in Shenandoah National Park. By looking carefully, you can see the Blue Ridge Parkway knifing through the mountains several miles away. Return the way you came if you have a single vehicle. Mile 8.6 – Return to your vehicle after following the same route back down the mountain. I've heard about The Priest for years and always thought the hike was beyond my ability. I'm 57 and in reasonably good shape, but I would say this is long and arduous but do-able for sure. So maybe it's reputation precedes itself? Several of the reviews here are NOT for the NorthBound hike from Rt. 56 but are from the AT coming southbound from Crabtree Falls or SpyRock. That trek is difficult (I did it a few weeks ago), but it does not compare to this NOBO hike straight uphill for 4.5 miles and 3,100 feet. 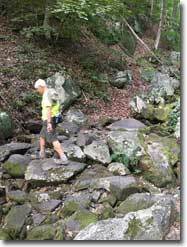 I was concerned about the Cripple Creek stream crossing, as other on hikes this Spring (White Oak Canyon, Sugar Hollow) have been tough or impossible. It's been a wet Spring and we had rain yesterday, but it was easy as the rocks are huge. This hike consists of 2/3 of the mountain with earth or scree trail for the most part, with the described 13% average grade. But the last 1.5 miles or 1/3 at the top consists of rocky underfoot, requiring placement of feet going up and coming down. And it's a much tougher grade, so that's where The Priest's reputation is earned. The view at 2.6 is amazing, as is the view at the rocks past the summit. 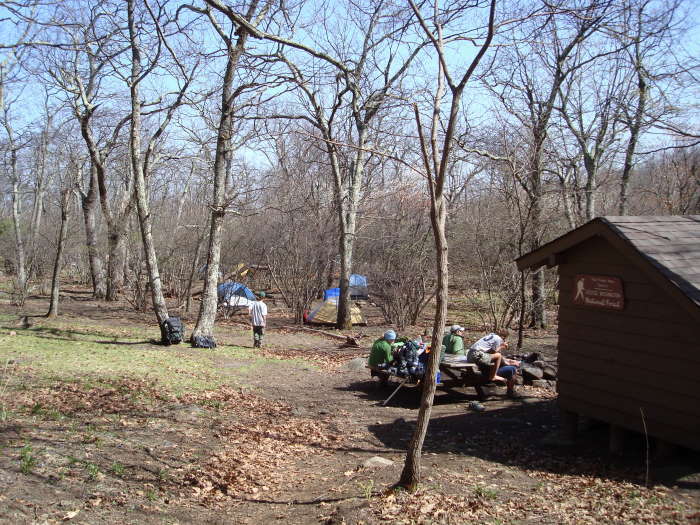 As other reviews stated, the summit is unmarked but when the trail flattens out and you are at the highest point, and sort of near a campfire area, you are there. The rocks with the view are .3 or so beyond and off to the right. You can't really miss it. For older or injured knees, the downhill retracing the trail is tough. Treking poles are helpful. The suggestion to park a car over at Crabtree and exit by hiking through is a good one. Can't wait to do this again. Lots of hikers, lots of campers at the top, loud music, cigarette butts. Such a shame. Difficult hike (did the over 8 mile route) but beautiful, well-maintained trail. I would give this one not very much solitude at all. We did a single overnight backpack up to the top of Priest, stayed over, and back the next day. Parking overnight at the trailhead (Priest Wilderness parking area on Rt. 56) was fine - space permitting, at your own risk of course. Looked like several groups were doing it. Be warned this time of year: camping at the top was cold and VERY windy. Be prepared. Otherwise, fairly straightforward, there are good sites around the Priest shelter and several other spots around the peak. The hike itself is, on the whole, moderately difficult. The distance isn't bad and trail quality is good, but 3000' is just a lot of work. I'm not in especially good shape, and my legs sure were glad I wasn't trying to go up and down the same day. The ridgeline is special and beautiful, though, worth the effort. This hike is no joke. There is no "warm up" before the climb. My husband said it perfectly, "It's like climbing stairs all the way up". There are very very few spots that kind of "levels out", but not enough to really count. Over all a challenging but pleasant hike in the trees. You pass a few streams along the first mile and a half. You are pretty much shaded by trees the entire time so it makes for a nice temperature even when the sun is out. The pay off would be much better if there wasn't people up there. But it is a well known spot so there was 6 other people that arrived after us and we saw a dozen more going up on our way back down. Also, if your are tracking this hike with GPS, and going NOBO on the trail, the turn off to the view is at about 4.75 miles from the sign saying "The Priest Wilderness, George Washington National Forest". Making this hike just over 9.5 miles. And we didn't really go off trail till the side trail to the view.